CMN attorneys Julie F. Wall, Craig M. Bargher, and Matthew H. Bunn recently authored the Illinois and Indiana chapters of the Defense Research Institute’s new life insurance book, “The Law of Life Insurance, Key Issues in Each State.” The book is a compendium of the major issues in life insurance law for all 50 states and the District of Columbia. It is an excellent resource for life insurance practitioners, particularly those with matters in multiple states. If you are interested in obtaining a copy of this book or would like more information, please feel free to contact any of the authors directly, or click here. CMN members William A. Chittenden, Joseph R. Jeffery and Jennifer S. Stegmaier recently co-authored the Chapter on Long-Term Care Insurance Law published in Appleman’s Treatise on Insurance Law. The treatise chapter serves as a primer on long-term care insurance products and covers a wide range of litigation and regulatory issues involving long-term care insurance. See, William A. Chittenden, III, Joseph R. Jeffery, Jennifer S. Stegmaier, New Appleman on Insurance Law Library Edition, Chp. 93A Long-Term Care Insurance (LexisNexis). If interested in obtaining a copy or for more information, please feel free to contact any of the authors directly. Chittenden, Murday & Novotny’s article “Recent Developments in Health Insurance, Life Insurance, and Disability Insurance Law” was recently published in the Tort Trial and Insurance Practice Law Journal at 52:2 Tort Trial & Ins. Prac. L.J. 431 (Winter 2017). The August 2016 issue of DRI’s For the Defense magazine features an in-depth examination of HIPAA’s Privacy and Security Rules, and potential exposure faced by health plans and their fiduciaries for breaches that lead to disclosure of protected health information, written by CMN member Elizabeth Doolin. This article presents crucial information about this rapidly-developing area of the law. 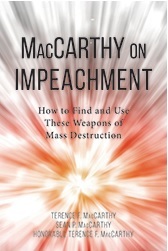 CMN is proud to announce that Firm member Sean MacCarthy has co-authorzed MacCarthy on Impeachment: How to Find and Use These Weapons of Mass Destruction, recently published by the American Bar Association. In the treatise, Sean shares the cross-examination and impeachment skills he developed in his role as a key member of CMN’s team of trial lawyers. Sean’s co-authors are Mr. Terence F. MacCarthy, Defender Emeritus, Federal Defender Program, Northern District of Illinois; and The Honorable Terence F. MacCarthy, Judge of the Circuit Court of Cook County, Illinois. Chittenden, Murday & Novotny’s article “Recent Developments in Health Insurance, Life Insurance, and Disability Insurance Law” was recently published in the Tort Trial and Insurance Practice Law Journal at 51:2 Tort Trial & Ins. Prac. L.J. 473 (Winter 2016). Chittenden, Murday & Novotny’s article “Recent Developments in Health Insurance, Life Insurance, and Disability Insurance Case Law” was recently published in the Tort Trial and Insurance Practice Law Journal at 50:2 Tort Trial & Ins. Prac. L.J. 401 (Winter 2015). David Novotny’s article, “Discovery Limitations in Arbitration Proceedings: Is the Price of ‘Efficiency’ Really Worth It?,” has been published in the May 2014 issue of the DuPage County Bar Association’s monthly journal, the DCBA Brief. See attached article. Chittenden, Murday & Novotny’s article “Recent Developments in Health Insurance, Life Insurance, and Disability Insurance Case Law” was recently published in the Tort Trial and Insurance Practice Law Journal at 49:1 Tort Trial & Ins. Prac. L.J. 233 (Fall 2013).